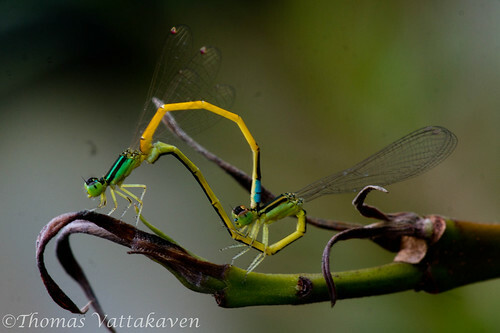 Nature Magnified: How Do Damselflies Mate? 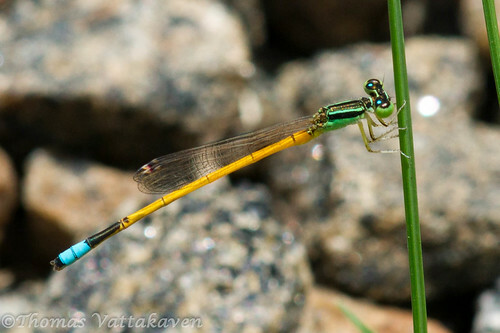 Damselflies are cousins of the dragonflies, both of which fall under the order Odonata. 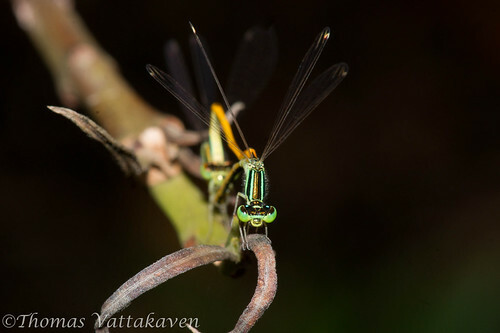 They are similar to dragonflies but they differ in a number of ways. The damselfies are smaller and are weaker fliers. 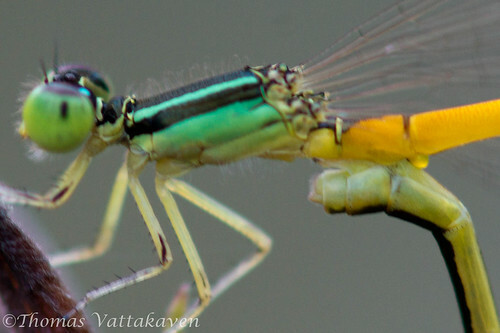 Their eyes are well separated from each other while those of dragonflies are closer. 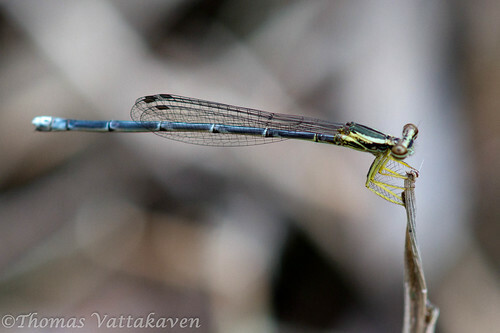 The damselflies also hold their wings parallel to their body when resting while most dragonflies hold it spread open. 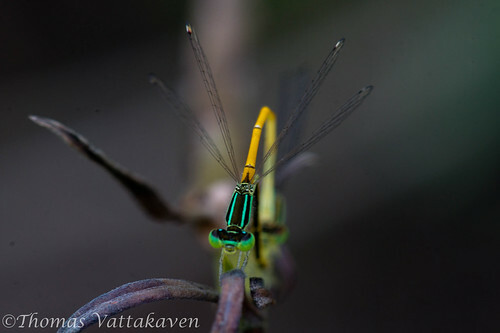 Finally, the hind and fore wings of damselflies are similar to each other while in the dragonflies the hind wing broadens towards the base. 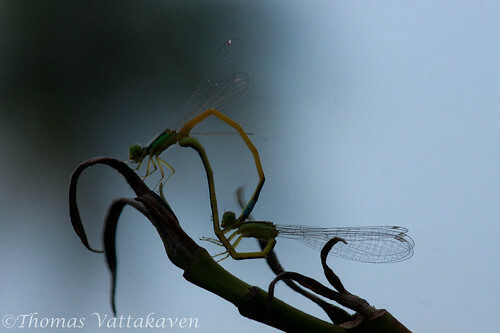 In mating, the damselfly is not too dissimilar from the dragonfly. 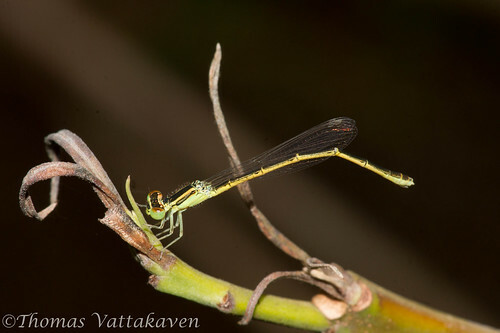 The male damselfly is territorial and has its own territory, into which he will not let other males. When the females are ready for mating they fly into the male’s territory. Before they copulate, the male and the female spend a considerable amount of time in physical contact with one another. 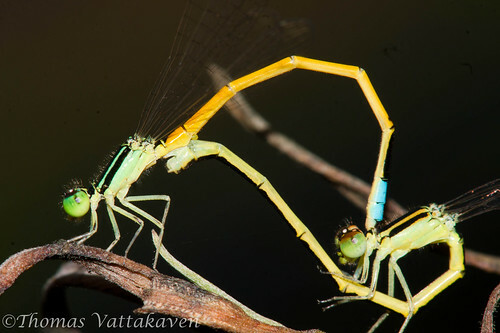 This is accomplished by the male clasping the female's thorax with terminal appendages at the end of his abdomen. (see here). These structures fit each other like a lock and key and are thought to aid in species recognition. Each species have slightly different structures on the male’s abdomen and the female’s thorax. 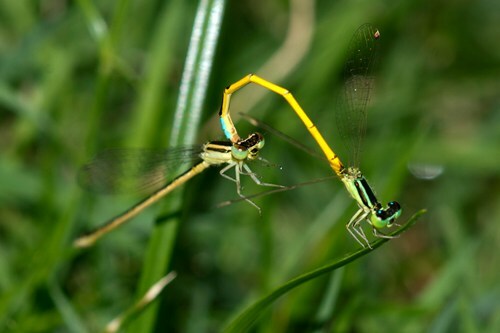 Courtship in damselflies involve, high frequency wing beats directed towards the female and her choice of a partner may be based on this display (not all species have a courtship). However, research has also found that the females prefer hot males (no pun intended!). A hotter (warmer) male is likely to come from a territory which is warmer and thus allow a better chance for her offspring to survive. The female shows her acceptance of the male by looping her abdomen forwards and upwards to the male genitalia to accept his sperm. Once this has happened, they may remain in this position for a while. It is thought that by prolonging the mating session by he ensures the ejection of a competitor’s sperm reserves from the female’s spermatheca and gives his own sperm a better chance at fertilization. 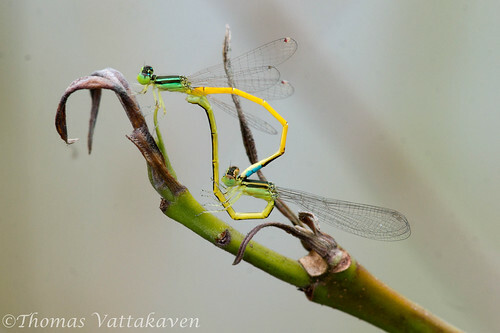 Once this has been accomplished, the male lets go of the female and flies away. 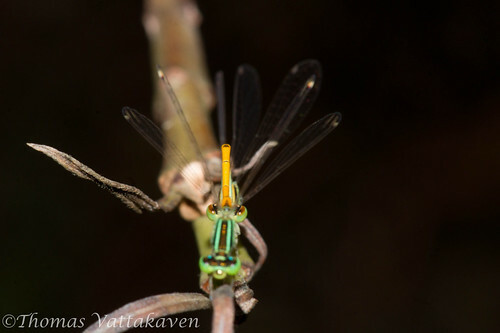 The female though rests a while on nearby plants until she is ready to fly herself. 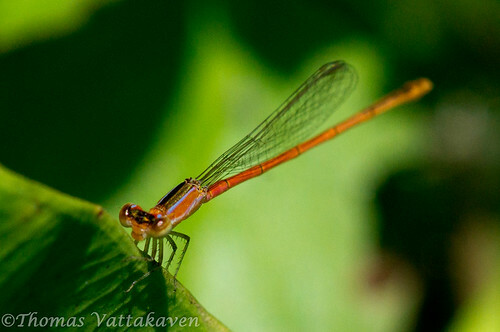 She finally flies away, and finds herself a pond or other stagnant water body, where she will lay her eggs. The larva that emerges will spend from 1-3 years in the water, feeding on other insect lavae such as mosquitoes. Once it emerges from the larval stage into an adult, it has just weeks to live before it mates and continues the cycle.